A return vi sit to Pen-Y-Ghent today this time with Paul and Debbie too. A cool, still morning fooled us into wrapping up in multiple layers but as soon as we got working up the inclines we quickly warmed up. Off came the coats and thick fleeces to be left with just base layers or micro fleeces with zips down and sleeves rolled up. Whilst the peaks are still wearing plenty of snow it did feel like some spring weather might be making an appearance at last. The assault to Pen-Y-Ghent’s summit from the south is almost one continuous climb with just the odd dip here and there that cheats you of your hard won gains. You can see profile on the climb stats. The final section is steep and rocky, initially with rough stone steps and then almost scrambling up rocks. By this point the guys had worked up a sweat and Debbie however was of course like all ladies merely “glowing”. The assent still felt as tough as last time I did it but whilst I was hot and certainly breathing harder my legs weren’t too bad at all –It felt like the gym work must be paying off. An early lunch at the top was a welcome break and I feasted on my tuna salad pitta followed by a Cliff energy bar and a quick cup of coffee. I took the chance to have another play with my camera. I’ve just picked up a Lowepro Apex 60AW belt mounted case which now means it’s quick and easy to grab my Fuji X10 rather than taking off my back pack to get it. I also tried the monopod camera adapter on my walking poles – it was a fiddly job so I don’t think I’ll be using it much whilst trekking but perhaps for night shots in camp when I’ll need a slower shutter speed and must minimise camera shake. I’ve posted some of the day’s photos on my Kilimattjaro facebook page. The descent was over snowy and slippery ground and so our poles were very useful as we slowly picked out way down the side of the mountain. There were plenty of people out on the hills today including fell runners who I have to have a begrudging admiration for their fitness, even if I do think it’s a crazy pursuit. One fell runner was bounding up the hill in the snow wearing nothing more than trainers and running shorts. Mad bugger! As we got to lower ground we detoured a few hundred feet from the path to show Paul and Debs a small waterfall and sinkhole. 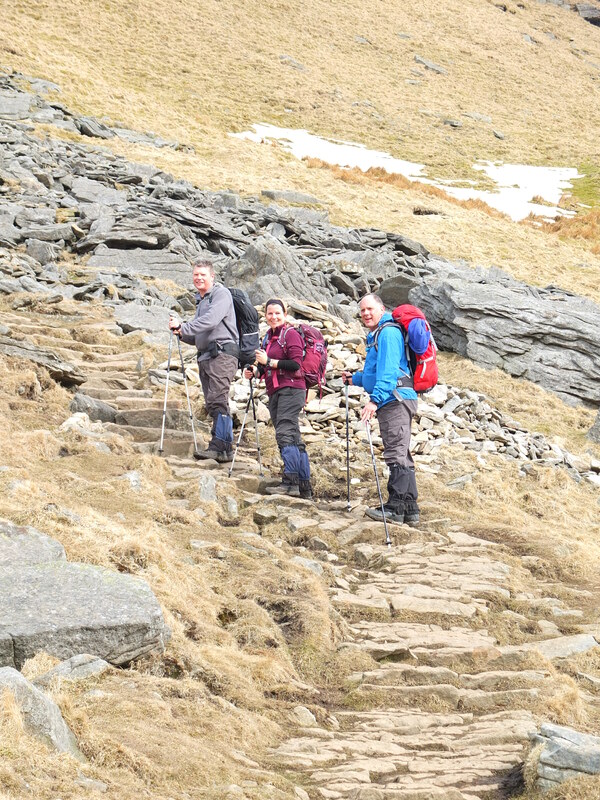 We then elected to take a more circular route to add few more miles to our walk before making our way back to Horton in Ribblesdale and a well-earned cup of tea in the café. I’m not free next weekend so my next hike will be in two weeks for another Pen-Y-Ghent return but this time at night!